View More In Jewelry Organizers. 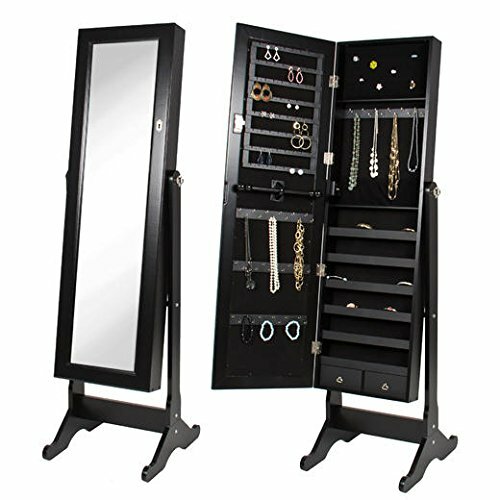 Store your rings, necklaces, bracelets, earrings, make-up stuff, money, scarf, tie and other valuables in an organized manner with this elegant jewelry armoire. Featuring magnetic lock plus a key lockable door, space-saving design and sturdy wood full size storage case stand box construction, this armoire is perfect for your home. Features Magnetic closure safety key lock, keeps other hands off the most precious stuff. Unbelievable organized storage space inside cabinet is incredible. Full-size adjustable mirror Wooden jewelry cabinet organizer armoire adjusts to three different angles for dressing or grooming Materials: very sturdy wood MDF style, glass and paint Shape: rectangle Tilting/adjusting California phase 2 compliant Full length adjustable mirror that opens to reveal deep luxurious Rows to hold 91 rings 144 dangling/stud earring holders 40 bracelets or necklace hooks One (1) rod for more scarf, ties or bracelets Two (2) drawers for your accessories One (1) pouch for holding notes, money or other items Four (4) shelves with 16 compartments for glasses, perfume, tie, watches, bracelets, or other valuable collections Earring holders, necklace hooks, bracelet rod, lined shelves, hand-lined with velvet tarnish resistant fabric, multi-layer quality finish Very easy assembly Important: other sellers claim wooden but their structure is composed of plastic holders. Ours is sturdy all wooden MDF structure Btexpert - is a registered trademark protected by the us trademark law and please make sure the jewelry products you order is Btexpert product and is sold by ocpower. If you have any questions about this product by BTEXPERT, contact us by completing and submitting the form below. If you are looking for a specif part number, please include it with your message.